BANGKOK, Oct 3 2013 (IPS) - An exiled leader of the Rohingyas, a persecuted Muslim minority in Myanmar, is raising the alarm from his London office about the fate of his community. He fears “ethnocide to remove all references to the Rohingyas” if the first census in 30 years goes ahead in the Southeast Asian nation. Similar concerns about this stateless ethnic group living along Myanmar’s western border have been expressed by Human Rights Watch (HRW). The 12-day census to be held by the end of March next year is expected to cost 58.5 million dollars, immigration and population minister Khin Yi confirmed during a mid-September media briefing in Naypidaw, the administrative capital. The Myanmar government has agreed to commit 15 million dollars, while U.N. assistance is expected to cover five million dollars. Western governments are expected to fill in the rest, including 16 million dollars from Britain and 2.8 million dollars from Australia. There have been further pledges by Norway and Switzerland. The concerns dogging the 2014 census arise from a slew of discriminatory policies targeting the Rohingyas for decades. Some, such as forced labour, are human rights violations faced by other minorities. Others have been unique to the Rohingyas – many are denied proper healthcare and schooling, are prevented from moving out of their villages, and are even stopped from marrying because they are not given approval by local authorities. Local leaders say tens of thousands of Rohingya babies have not been registered. They are not officially identified as one of the country’s 135 recognised ethnic groups. The last headcount in 1983 put the national population at 35.4 million, while the registered population during the previous census in 1973 was 28.9 million. These two censuses, held when the country was under the grip of an oppressive military regime, did not recognise the Rohingyas as part of the population. Official statements and the local media often refer to the estimated 800,000 Rohingyas as “Bengalis.” By implication the community are considered “outsiders” from neighbouring Bangladesh. UNFPA has received assurances from the government to conduct the census “in line with international census standards, [where] every person will be counted, regardless of citizenship or ethnicity.” Jackson expects the population profile for a country that has an estimated 60 million people to embrace “inclusiveness”. Such words jar with the reality on the ground since sectarian violence erupted last year between the ethnic Buddhist Arakanese in predominantly Buddhist Myanmar and the Rohingyas. Attacks on the Rohingyas in June this year and October last year, which killed nearly 200 people and left 140,000 displaced, earned the Rohingyas some sympathy. HRW described them as victims of “ethnic cleansing” in a report released in April this year. That grim assessment has worsened. The Toronto-based Sentinel Project for Genocide Prevention describes Myanmar as “a textbook case” for a country on the brink of genocide. 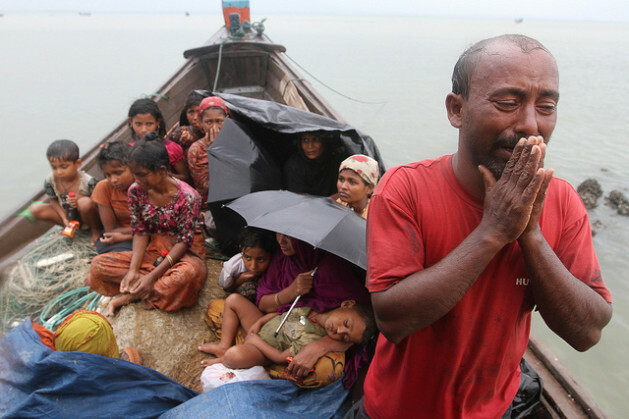 “The machinery of genocide – the complex systematic process designed to eliminate the Rohingyas – is already operating in Burma [as Myanmar was formerly known] and has carried ethnic cleansing and isolation to its current point. Clearly there are many forms of persecution. Ethnocide is a new term to me, a form of genocide of an ethnic group. We need to help bring about Global Liberation for all oppressed and repressed peoples. What is the ‘exceptional’ U.S. Regime doing about this injustice!? We need to take the time to study and understand these issues, not just scan over it and go on to the next critical issue. What can we do to change it? Keep your own personal conversations relevant and related to what is really important. Each of us can make a critical difference. Find your courage to help raise a global revolutionary consciousness! I remember reading about the Rohingyas probably a year ago. The article I read then was stating that they were a people no one wanted. Burma’s governmental voice gave a clear message that they could not handle the number of Rohingyas that could immigrate into Burma. Furthermore that Burma was afraid of what it would do to their economic infrastructure were they to take in such a large ethnic people. Then I took the opportunity to post an article on my own in response to what I had heard, and took the time to look up the Rohingyae people on Wikipedia to see what I could learn. What I found was shocking. I remember reading that for a certain period of time there was terroristic behavior with that ethnic group. After reading this, I shied away from the topic. As a fellow human being, I apologize for my ignorance or lack of learning more. I have learned from following the activity and history of the Hamas that one and even many of a group can change terroristic behavior into socially acceptable behavior within the scope of our world. No ethnic people should be excluded in our world. I feel it is of the utmost importance to preserve the past into our present day, and secure it for the future. I feel strongly that if one particular country isn’t able to take in all of the Rohingyae people, the quite possibly several countries could share the task and burden. Jordan is a perfect example of one country’s ability to help its neighbor by taking in more than 1.2 million refugees. I think it would be safe to say that Jordan and its citizens never saw the Syrian conflict as a plight of humanitarian care that they would undergo and encompass for the sake of the Syrian people. If the UN Peacekeeping Committee could determine which countries could foster a portion of the Rohingyae people, then plans could begin on delegating and transplanting the people to their new home/country.